THE GRACE CARD is a powerful story about grace and forgiveness that is sure to have people talking after they've seen the movie. And it may raise some issues that they haven't dealt with in the past. That's why there are a number of great resources available, both for churches and for individuals. 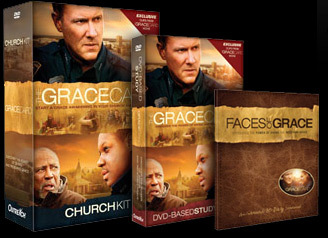 Faces of Grace, a 30-day devotional written by the pastoral staff of Calvary Church. Delve deeper into some of the key themes from THE GRACE CARD by accessing this four-part Bible study written by Pastor Lynn Holmes, the pastor of the church that made the film. Ideal for small groups or individuals, the study tackles issues like grace, legacy, and relationships. THE GRACE CARD touches on some emotional topics including issues like anger, lack-of-forgiveness, marital problems, parent/teen issues, racial reconciliation and more. If you find yourself needing to talk through some similar concerns (or if you know someone that needs help), here are some ministries and resources that can help. Focus has a team of experienced licensed counselors available and offers one free consultation with a counselor, as well as referrals to local counselors in your area. They also offer resources that address many themes in the film. Learn more at the website or call 1.800.A.Family. One of the nation's largest providers of outpatient counseling services, Samaritan is an association of faith-based counseling centers with offices in nearly 400 cities. Counseling is provided by licensed professionals. For more information or to find a location, visit their website. By Gary R. Collins Ph.D.